This is an ideal breakfast dish for the weekends or days when you want something more filling than oats. You can use different tofu flavours like smoked tofu or nut tofus or even a softer tofu but I used plain, hard tofu here as it crumbles well and takes on the flavour of the onions and peppers well. Heat the oil gently in a frying pan and add the onions, peppers and garlic. Sweat down for about 5 minutes then add the crumbled tofu, herbs and seasoning. Meanwhile make the toast and fry the mushrooms in a separate pan. Cook the scramble until the vegetables are soft. 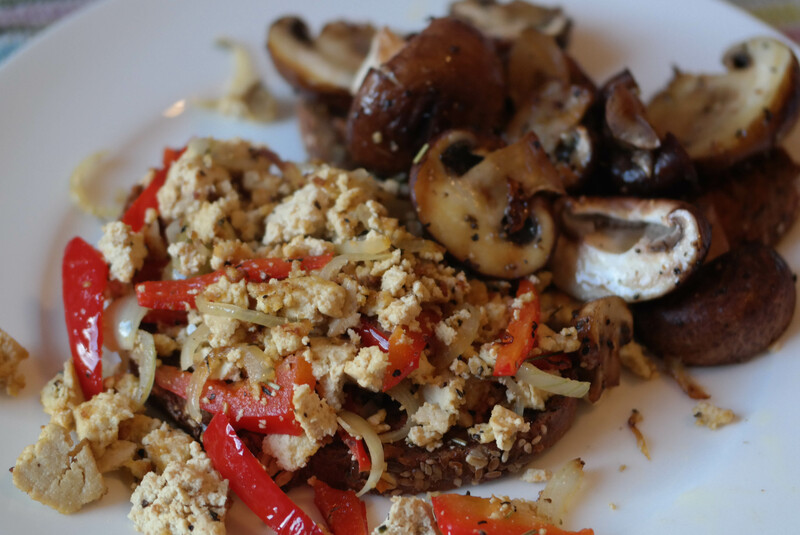 Spread the toast thinly with non-dairy spread or hummus and serve with the tofu scramble and mushrooms. The sun has been shining a lot this February in Berlin and it makes me think more about summer food. There are some decent organic avocados in the shops, although they have travelled a long way. Potatoes are always delicious in Germany and there are some lovely salad version available. 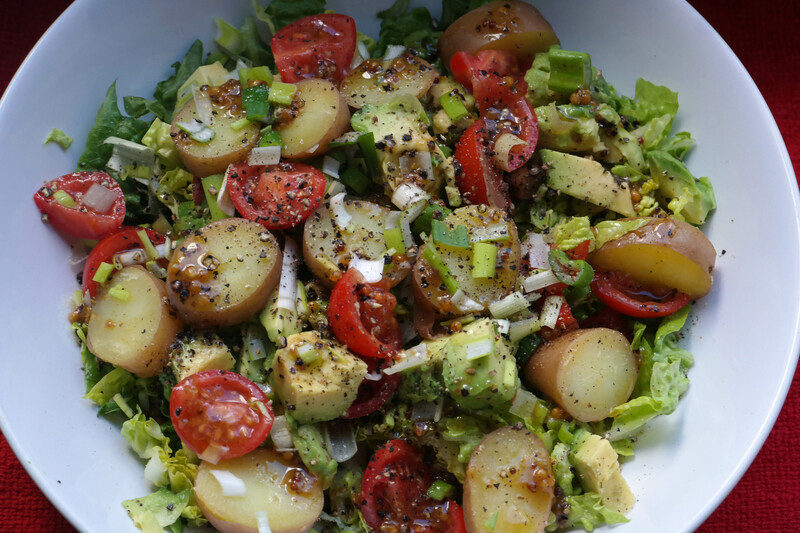 This is a hearty, rich salad which should only be lightly dressed otherwise it becomes too cloying. It is best with the potatoes still warm. Boil the potatoes whole for 20 minutes and rinse in cold water to stop cooking. Finely chop the lettuce and place in the bottom of a bowl. Add tomatoes and the avocado chopped. Add the potatoes to the top of the salad and then sprinkle over the onion. Dress lightly and season to taste. There are some very large pomegranates in the supermarkets in Berlin at the moment and they are really juicy. 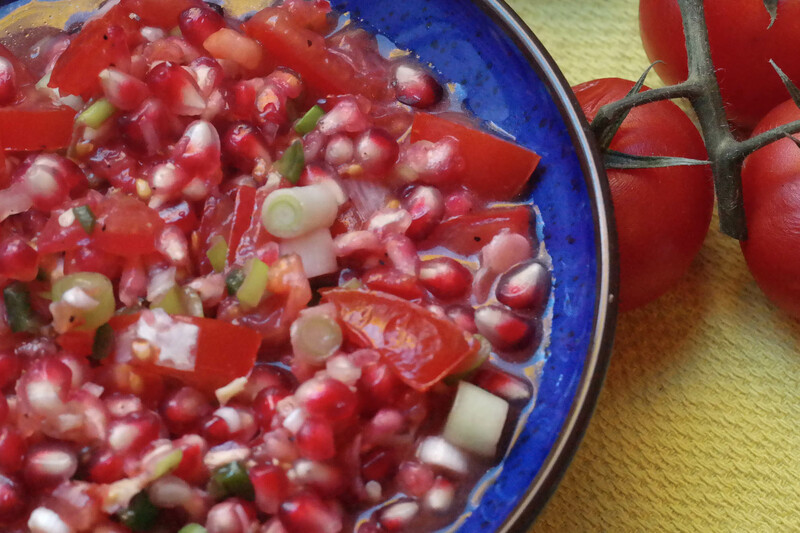 This is deliciously fresh and healthy and works really well served with the eggplant pilaf. We like it spicy in our house, so bear this in mind! Use the best tomatoes you can find. Combine all of the ingredients in a medium bowl and season to taste. Leave for an hour before eating for the flavours to develop. I keep complaining how hard it is to get really good Indian food in Berlin. Sometimes I need to eat a plate of Indian food that is vibrant with the complex flavours of fresh, whole spices. That is hard to find here so I have to cook it myself. I like this dish because, although it is rice based, it is light and not at all stodgy. Use the best basmati rice that you can afford and rinse it well before use then be very careful to cook it lightly as it can turn to mush easily. Both eggplant and mushroom have good, strong texture and hold their flavour well. The toasted almonds add extra flavour and texture. It is really important to use fresh, whole spices, powder is just not the same in this dish. Fry the onions gently in half of the oil until they are dark brown but not burnt. In a separate pan fry the eggplant and mushrooms in the rest of the oil. Toast all of the whole spices in a small dry pan but be careful not to burn them. Then combine them together with the chili, garlic, ginger paste, rice, onions, eggplant, mushrooms, chickpeas and tomatoes in a larger pan. Add just enough water to barely cover the rice and season. Bring slowly to the boil and cover tightly with some foil before putting on the lid. Turn to a very low simmer until the rice is about two thirds cooked. Do not stir during this time.This will take about 15 minutes. Then turn off the heat and leave with the lid on tight for a further 5 minutes. 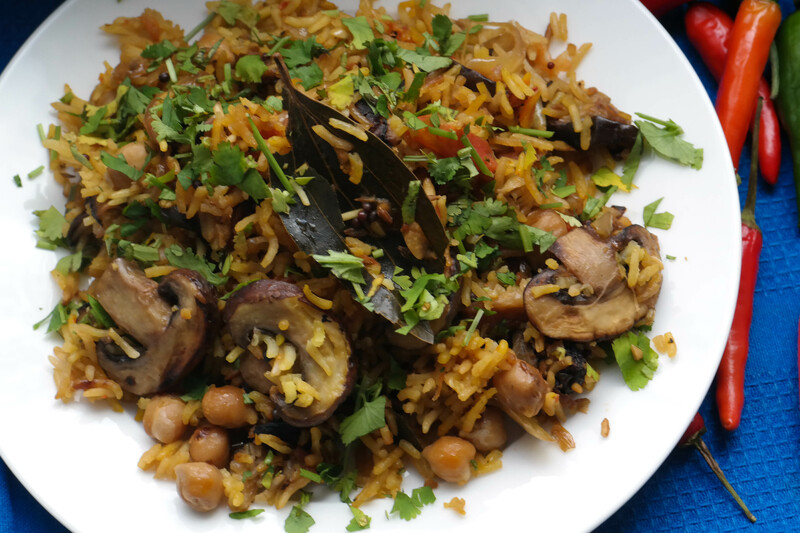 Turn out onto a plate and liberally garnish with almonds and coriander. You may remember that in September, I raved about Dr. Joel Fuhrman’s book Super Immunity. I promised to try out the super immunity boosting diet to test if it prevented me from getting a cold this winter. Well the news is that I have been eating in accordance with the diet since September. I have filled my fridge with mushrooms, greens and onions and have been incorporating them into almost every meal. Beans have also been a huge part of my eating plan, whether tinned white, black or red or soy in the form of tofu and edamame. Spoonfuls of linseed have gone into nearly everything. Only berries have eluded me. I have tried to buy dried cranberries each week and use them when I eat muesli but this is not often. I do not eat as much fruit as I do veg and the fresh berries shipped from the other side of the world or grown in Europe under plastic, do no appeal to me. I know I could do better and be more imaginative with the berries. I think the supplements recommended by Dr. Fuhrman help a lot. I do not normally take supplements beyond B12 daily and iron when I need it. However, I have been taking 15 mg of zinc each day plus Vitamin D. I increase the zinc to 30mg is I feel I may have a cold coming. I have done this 3-4 times since the autumn. I have also been sitting in front of my Lumie daylight lamp at my desk for about two hours each work day since early October. I am not sure whether it is one or a combination of these things that are helping but I have found the winter very easy so far and, despite the dark days, I have been surprisingly cheerful and energetic. Of course, I might be counting my chickens before they are hatched so I will let you know the final results in April, when spring arrives. Hello to all of my followers. I have been off the radar for a few months. My camera broke and I had to have it repaired. I then found myself to busy to post, although I haven’t stopped cooking! We then got into the wintertime and I just felt uninspired by the available ingredients here in Berlin. It is interesting that today I looked at the the other vegan blogs I follow for the first time in weeks and found that many people post less in winter- just when we need the most inspiration and should be taking the best care of ourselves. I am delighted to see today that I have received nearly 2500 hits since I started last August and the hits and new followers have kept on coming, even during my quiet period. This gives me the inspiration to pick up where I left off, spreading the word about great, simple, plan-based dishes. So today I am back. I have cooked a few nice recipes in the last couple of days and I will be posting the this week. I look forward to your feedback. Because everybody should try going vegan! Dedicated to health and wellness! A little everyday goes a long way. As long as you believe. Dial in to your health. Gluten free, dairy free recipes for vegetarians! On my ad-free cooking blog I only post recipes that people tell me they love - some are healthy, some are not, but they are all delicious! I record these recipes because I love to cook, and people tell me they appreciate looking at and trying out my recipes. Please write a comment if you have any thoughts about my posts so I know if I should keep experimenting with new recipes, documenting them, and paying to keep this blog advertisement-free. Thanks for the feedback! Enjoy!